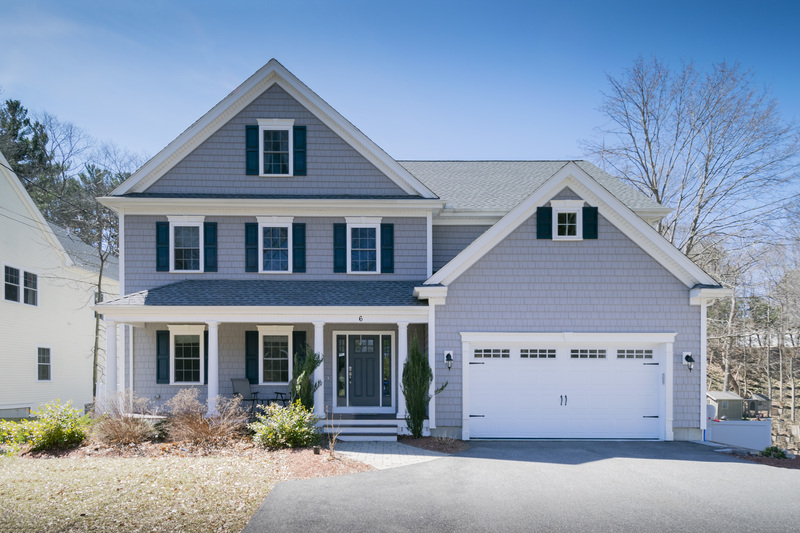 You’ll love coming home to this young, ‘like-new’ Colonial full of modern style and curb appeal galore. A stone pathway welcomes you to the inviting farmer’s porch defined by stately columns as lush perennials surround the home awaiting the arrival of spring. The front foyer welcomes you with great attention to detail including wainscoting and crown molding accents as gleaming hardwood floors begin to span throughout. The foyer draws you into the light-filled formal living room on the left with crown molding and shining hardwood floors. French doors open to the formal dining room where all eyes will be drawn to the beautiful tray ceiling accented by an elegant chandelier. Double windows offer delightful views to the backyard and beyond as wainscoting and abundant natural light encircle the lovely room. This is the perfect setting for hosting special dinner parties with family and friends. The stunning, kitchen is a place all will love to gather as the chef prepares culinary delights with granite counters, stainless steel appliances, gas cooking, a huge breakfast bar island, hardwood floors, a pantry closet, tiled backsplash, gas cooking, stylish off-white cabinetry, crown molding, recessed lighting, and sparkling hardwood floors. A bay of windows surrounds the cheerful informal dining area as the kitchen spills further into the spacious, open plan family room. A marble-tiled gas fireplace, with a stylish white surround and built-in cabinetry, provides a cozy place to gather on chilly nights. Crown molding and gleaming hardwood floors grace the family room delivering the perfect space for comfortable living and entertaining. A sliding French door from the informal dining area brings you close to nature in the delightful sunroom with walls of windows overlooking the spacious and fully-fenced backyard. The sunroom offers a great connection to the covered deck and a huge stone patio where many summer days will be spent relaxing and entertaining. The kitchen and family room area offers convenient access to the home’s two-car garage, perfect for managing an active lifestyle. A half bathroom with a pedestal sink and marble floor tiles completes the first level. Wainscoting spans the staircase leading to the thoughtfully designed second level with the master suite and three more large family bedrooms. Prepare to be amazed in the spacious master bedroom full of natural light with hardwood floors and recessed lighting. The large walk-in closet is perfectly outfitted with built-ins to keep your wardrobe organized. The master bathroom stuns in neutral tones with a dual sink vanity, granite countertops, a marble tiled shower with a frameless glass door, Jacuzzi tub, and a marble tiled floor. Three more large family bedrooms on the second level feature hardwood floors and double closets. The full family bathroom is beautifully appointed with a granite-topped dual sink vanity, large linen closet, and is tiled with a tub and shower. Enjoy the added convenience of the efficient laundry area located on the bedroom level. This wonderful home continues to impress with more finished space on the third level featuring the home’s fifth bedroom, a sitting room, and another full bathroom offering the perfect space for use as a teen or guest suite. Natural light streams into the sitting room with a built-in window seat and shining hardwood floors. The hardwood floors continue to span into the bedroom with a large double closet. Modern style defines the third level bathroom with a granite-topped vanity counter and a tiled tub with shower. The huge walkout lower level offers abundant additional storage or future expansion potential with full-height windows and a sliding glass door connecting with the patio and backyard. Central air conditioning keeps the home comfortable during summer months. Enjoy a popular neighborhood steps to Kinneens Park, convenient to the town center, and within walking distance to Diamond Middle School. Lace up your sneakers and explore the walking trails of the nearby Willard’s Woods conservation land. Take advantage of easy access to major highway routes including Route 128. The Burlington Mall and its surrounding fine dining options are only a short drive away. Welcome home to the highly desirable community of Lexington known for its excellent public schools, rich history, open conservation land and parks, and dynamic community life.